Now consider that this intense focus on nursing is occurring amidst an almost crippling nurse staffing shortage nationwide. The fact is, nursing is not accustomed to having their documentation be an important driver of Medicare Part A reimbursement as the current system is driven largely by therapy intensity. The pressure is now on nursing to rise to the occasion! Where Does That Leave Therapy Services? 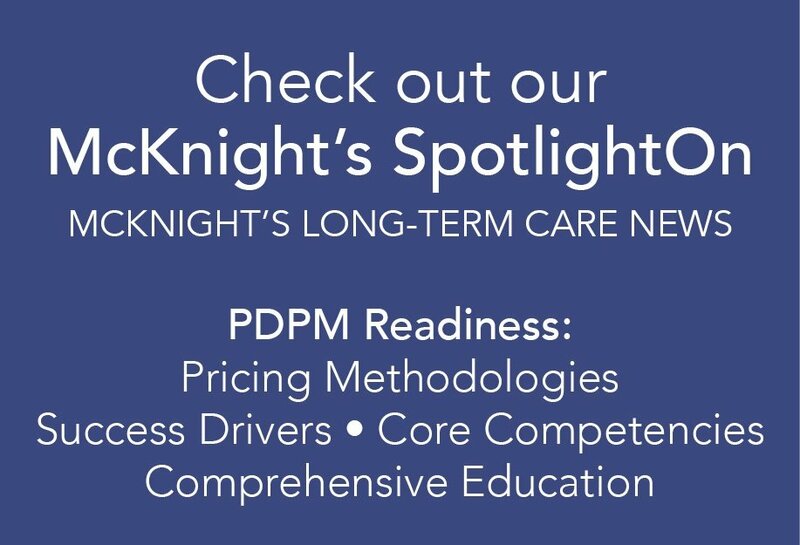 PDPM will require that we redefine what to expect from therapy; it will continue to be just as integral a player in driving and protecting revenue as ever before… but in a very different way. Under PDPM, therapy is in an ideal position to offer support that extends far beyond providing traditional rehab services. After all, for the last 20 years of RUG-IV, therapy has become very skilled at defining the processes to accurately capture reimbursement. The tables have turned with PDPM, and nursing will take center stage. What if therapy’s strengths and skills can be leveraged to better support nursing from both a service delivery and documentation perspective? Frankly, therapy has always been capable of playing a more active role among the IDT (as with case management and care coordination), and now PDPM is creating an opportunity for that to become a priority and is paving a new road for therapy contributions. For example, HealthPRO® Heritage’s approach will be to lock elbows with nursing to reduce their burden and support their new role in the driver’s seat. There is an opportunity to reinforce a truly collaborative approach to resident care by building and supporting clinical programs and enhancing nursing care in more skilled ways. Specifically, we are talking about critical, yet time-intensive, focus areas like wound care, pain management, medication management, health literacy/family education, cognitive assessments, and behavioral interventions. Don’t let the PDPM burden rest solely on the shoulders of your nursing staff. If responsibilities for care planning and patient management are not shared (as with an integrated, complimentary approach described above) the impact on nursing services/staffing, resident care, and ultimately fiscal stability could be negative. Instead, focus on leveraging innovative, trans-disciplinary care, and documentation models to enhance patient experience while securing appropriate reimbursement. And, don’t believe the hype! Getting therapy right and defining these types of collaborative programs and processes will help you successfully navigate this transition and create a stronger patient care platform and reimbursement outlook.